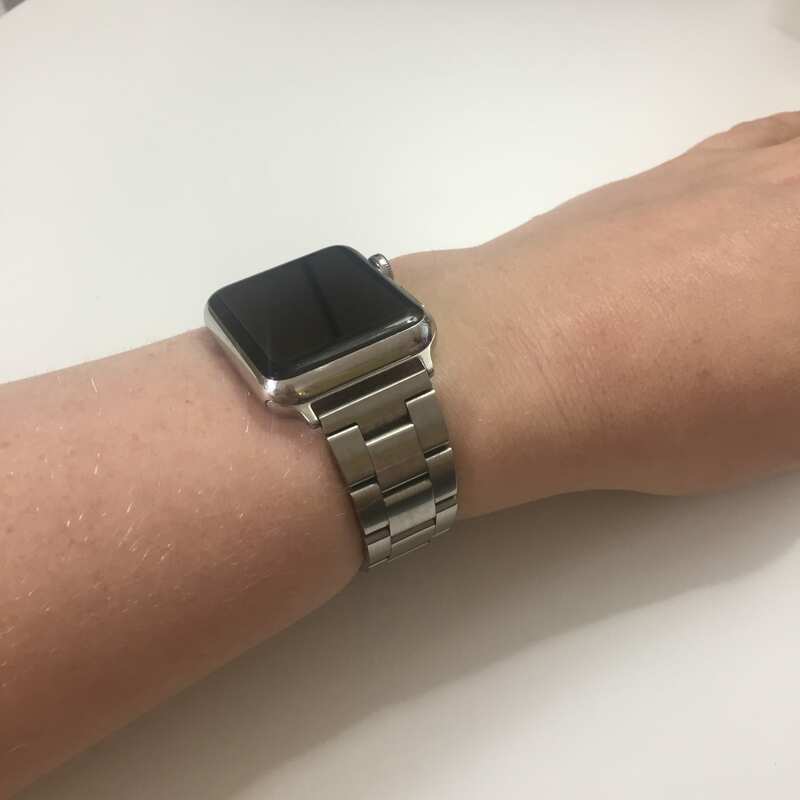 When I got my Apple Watch last year, I went for the middle of the range option that came with a black leather strap. That was fine, but I wanted more interesting options. It seems odd, but despite coming out over a year ago, there still aren’t that many pretty straps out there, so I thought I’d share which ones I have! First, the black leather strap it came with. It’s fine, it’s a basic look. £129 for it though seems a little crazy. I picked up a red leather strap that is similar from eBay, but it’s not one I use much since the connectors that attach the strap to the watch feel a little loose. At the same time, I bought this metal link strap* which also isn’t perfect but cost significantly less than the metal link strap direct from Apple! After joining the gym and going on a regular basis, I bought a turquoise sport strap from Apple for a little less than the £39 on the store thanks to a discount I get through work. I really want the yellow strap, but it’s always out of stock in the UK. Finally, the two prettiest straps I have are from a company called Case-Mate – I bought the pink plasticy chain link effect one* and the “Brilliance” strap* from Amazon. The pink one looks pretty cool, although is difficult to get on since it’s one piece, but the brilliance one is probably my favourite as it’s silvery, and a little sparkly. Since I don’t really wear jewerllery much, this is the only thing I change up to match outfits, so why can’t I buy more pretty straps? Such a non problem! When I first learnt about Mondo, I was intrigued – at the moment, it’s a pre-paid card that you load with cash, and you top it up as and when you want to. They (literally – just a few days ago!) became a bank, but launched as a prepaid card to allow them to test out the functions and build on them as necessary. Mondo (at the moment) is phone based, and allows you to add notes to transactions, attach photos of the receipt, and categorise them. You can then search by the merchant, by the category, by location, and by amount. There’s a little graph as well that will show you how quickly you’re spending your money. I have been looking for a way to be able to look at what I spend on a monthly basis, but none of the main banks have anything built in, so you have to download your transactions into another program like YNAB and then work through them to sort them out. That’s fine for some people, but I found it was more detailed than I needed it to be, and would take a bit of time to get everything categorised. Having Mondo on my phone makes it easy to make a note of items when I spend the money. Alex and I both have a card, and use them for our daily spending – another bonus for me is that it’s contactless. However, it’s not the technology side of things that makes me recommend it (although I really like what they’re doing!) but how quick they are to deal with things. Last month, we just got home from a long drive and as I checked my emails, my Watch vibrated to tell me a charge had been made to my card from Nike. Of course, this wasn’t something I had done, so I opened up the app and could see that this was a Paypal transaction. Getting the notification so quickly that a charge was made meant I could deal with it quickly, and after half an hour, I had made sure the order was cancelled, my Paypal password was updated, and I had the ability to freeze my Mondo card through the app so no further charges could be made. A few days later, we went to the Zoo, and my card didn’t go through their system the first time, although the charge showed on my statement. I put it through again, and it went through fine. I then opened up the chat in the Mondo app and said that it looked like I had been charged twice, although I had confirmation from the till that said the first transaction didn’t go through. Within 10 minutes, the first charge had been removed and my balance was as it should be. It’s silly that these things are surprising but I would recommend Mondo to anyone – just download the app and join the waiting list.